Here's a fun Christmas card, this time using stamps from several sets. I realize this should have been posted sooner as this embossing folder has been retired and is now out of stock but some family health issues have taken precedence lately! I'm sad this folder has been retired for it was a great one and so popular! *See update below!! 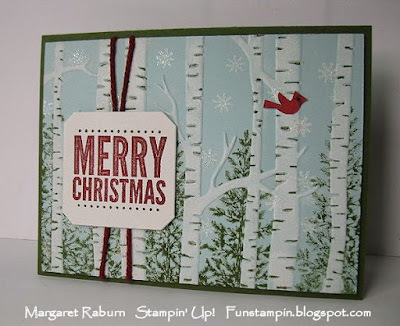 First I stamped the evergreen tree from Lovely as a Tree onto the inked folder. This makes the evergreen appear behind the tree trunks. I used my Mossy Meadow Marker to mark all the lines on the tree. Stamp the snowflakes with White Craft Ink, sprinkle with Iridescent Ice Embossing Powder and heat with Heat Tool. This gives them some lovely sparkle! Wrap Cherry Cobbler Twine around the card front layer twice and fasten to the back. 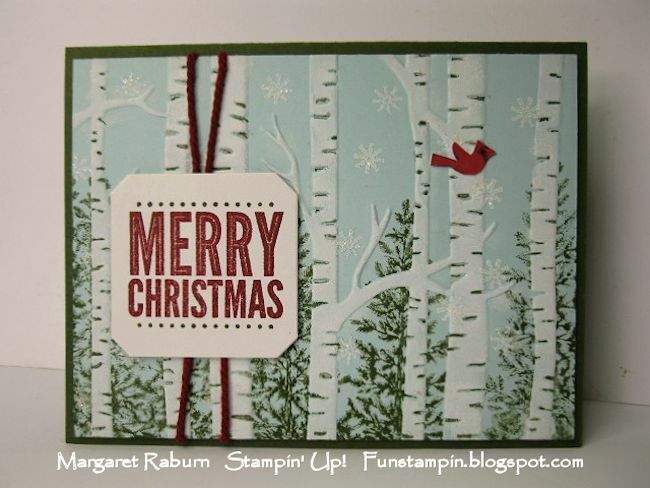 Stamp "Merry Christmas" on White Cardstock and cut out. Stamp cardinal from Festival of Trees in Real Red on White cardstock and cut out. Adhere to background. Adhere embossed layer to a Mossy Meadow card with Dimensionals. Accessories/Tools: Cherry Cobbler Twine, Iridescent Ice Embossing Powder, Dimensionals, Woodlands Embossing Folder (now retired and out of stock). *Update! Stampin' Up! has announced this folder has been so popular they are bringing it out of retirement and it will be available in the new 2016-17 Catalog this coming June!! Yay!! I have one more card using this embossing folder I'll post soon! 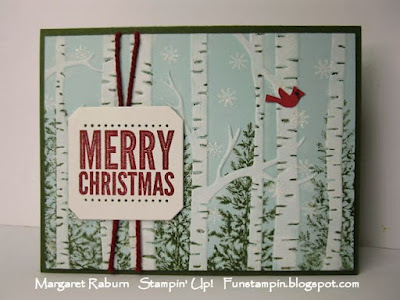 Don't forget about the first ever YEAR END SALE from Stampin' Up! Retiring Items from the Holiday Catalog plus other items from the previous catalog and the Clearance Rack all combined!! 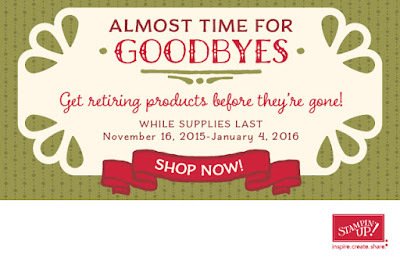 Retiring products will only be available until January 4, or while supplies last! When you place your order through my Stampin' Up! website, please use the Hostess Code KVJFNSVK for your order. You may earn free product! However, if your order is $150. or more, do not use this code as you may choose your own rewards! Sorry to hear about family illnesses, Margaret. I have good news for you though. Stampin' Up! decided to put this embossing folder into the 2016-2017 Annual catalog because it was so popular this fall. I don't know if it will be available to purchase this spring when they get more inventory or if we will have to wait until June. Thanks, Sue! I missed that announcement but have looked it up and it will be available when the 2016-17 Annual Catalog comes out in May/June. Thanks for the heads up!